Hi Everyone, Jutta Maraun here with the honor of being Quietfire Design guest designer for August. 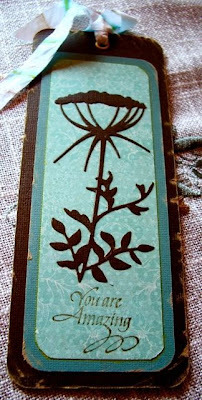 I have enjoyed using Quietfire Design Stamps and products since my dear friend Holly introduced me to them in 2010. 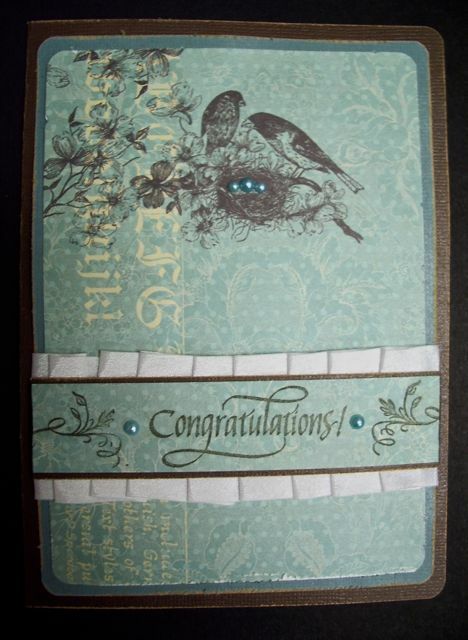 Today I’d like to share with you my Versatile Congratulations Card. The wonderful Home – Congratulations! Stampset and Webster’s Pages 6x6 designer paper are the inspiration for this card. I call it versatile because after I added the pearls to the nest I thought it will work as a Congrats on starting a family card too. To begin, I cut a base and the mat from TH Kraft-core Nostalgic collection 12x12 Cardstock stack. Then I stamped the 1-1/2” White Silk Ribbon with Congratulations and Floral Scrolls from the Home – Congratulations! Stampset. To assemble I adhered the Designer paper to the Kraft-core mat, then attached the Ribbon with two strips of 3/16” Be creative Double Sided Tape. Then this lot was attached to the base and coloured beads were added. With the left over pieces I made this Bookmark. The You are Amazing stamp is one of my all time favorites. The Die is Memory Box Umbrell and the Ribbon is the ½” White Silk to which I added Distress Ink stripes in matching colours. I hope you enjoyed my projects today. Thanks for allowing me to share! Fabulous card Jutta! We can never have too many bookmarks- love it. Nice stamping on the ribbon too. Beautiful Jutta! LOVE the colours and you're so right about the versatility of the card. Thanks for sharing! Beautiful! I love the pearls in the nest. Both are wonderful creations! I love the blue pearl eggs in the nest. Could even work as a new home owners.